Maps for orienteering and mountainbike orienteering (MTBO) from Holiday Mappers, processed in the standard IOF, have been succesfully used at World Cup event, the national championships, world ranking and national competitions and many other races and orienteering activities. More than 270 mapping projects realized in cooperation with various mapmakers. We cooperate with Cartographic service (Jiří Daněk), Olles (Aleš Hejna) and the other great persons of the Czech mapping scene like Zdeněk Lenhart, Evžen Cigoš, Vlastislav Šebesta, Radovan Čech, Ondřej Kotecký, Zdeněk Sokolář, Petr Mareček, Petr Matula, Petr Hranička, Daniel Lebar or Martin Lejsek and the other good mapmakers like Robert Miček or Rudi de Ferrari. Based on the content and the ancient date of my previous post, one might think that the water has closed behind me long ago in Turkey. But in fact the rain was not such terrible so I live and make maps on and on, I'm just not able to document it here continuously. Already the last year I started the third hundred of maps and I am pleased that just the map of Brno, on which the final of the Czech Championship in Sprint 2017 was held, has the exact serial number 200h in my records. For this year, among others, I made (together with Zdeněk Sokolář and Petr Matula) maps for a Czech national event INOV-8 CUP, organized by my club SK Praga. By the way, someone may ask what is on the icon in the header of this article. A hint: there is the map symbol "High Tower" in the middle... You still don't know? It is a cutout from the Serbian map named Avala with a 205 m high TV tower of the same name, the highest tower in the Balkans. The first of the maps named Réna was used for Czech Relay Cup event on June 5th. Czech Middle Distance Championship (and a World Ranking Event) was held on the last weekend in demanding stony terrains of Novohradské hory in the South Bohemian Region, organized by my club SK Praga. A map named 1034 metry vysoká was used for the Saturday's Qualification, while Napoleonova hlava for the Final on Sunday. First article after 13 months...Last year I started to work with tablet. It was a very pleasant change. I enjoyed two mapping stays in France. The beginnings with tablet were funny, but the change is definitely better. This year there is a plan to realize finally a bigger map on south hill of Jested, behind my house, for Czech national B competition organized by my club in May 2017. During 2014 I was concentrating mainly on several academic projects, monograph and exhibition of sculptor Mary Duras, but in October even one mapping session came. Together with my stable mapping partner Radims and for the first time with Zdeněk Janů we realized a stay in France. We spent two weeks in the forest near saddleback Col de la Loge in Massif Central. It was very nice pleasant mapping, nice and surprisingly warm weather. After this mapping I found it comes the moment to change my old-school mapping technique. For 2015 I would like to try the work on tablet in combination with GPS. Almost half year passed since my last post here so I have mapped and digitized another couple of square kilometers in the meanwhile. And even 4 maps made this spring had their racing debut during the last 2 weeks. Two weekends back (September 5-7) it was, firstly, two events of Norwegian Championships, organized by the club OL Trollelg near Trondheim - Friday's Night champ on the map Skjøla (mapped together with Aleš Hejna, Milan Bílý and Bob Háj) and Sunday's Junior relay champ on the map Gjenvollhytta (western part, mapped with A. Hejna and M. Bílý). You can find links to the both maps with courses and GPS-tracking here. And secondly on the same weekend, two regional championships of Dalarna County in Sweden (the Middle on Saturday and the Long on Sunday) was organized by the club Domnarvets GOIF from Borlänge on the map Korpklacken Noran (mapped and revisited with Roman Horký). You can view the map with courses, split times and routechoices through a handy MapandCoach application: Saturday and Sunday. Finally, on last Saturday (Sep 13th) a sprint race was held on my map Hostinné (in the Czech Republic) as an event of Czech Cup and INOV-8 CUP, organized by the club Lokomtiva Trutnov. Also this map with courses (setted by Jan Petržela, a member of Czech A-team) you can find on smart o-websites: RouteGadget or World-of-O. Spring has arrived! While in the last year the most important competitions in which we participated as mapmakers were the main events for juniors (Ivo's JEC and my JWOC), this year seems to be primarily in the sign of World Cup events. Already this weekend on April 5th-6th, two races (the Long on Saturday and the Middle on Sunday) of the second round of the WC 2014 will be held in Spain, near Cehegín in the region of Murcia. Namely on the map Coto de las Maravillas, in whose previous versions issued in 2010 and 2011 we (Ivo as well as me) also participated. The past version of the map was updated and significantly extended to northeast by five of our colleagues from Moravia in the last November. Unfortunately we were unable to attend this mapping because of a lack of time. In addition, a month ago the first round of the World Cup took place in Turkey, near Kemer in the province of Antalya. I have wrote about the relevant mapping here just one year ago. There was held the Model Event in my part of the map Phaselis East (for now you can look here in the archive of everywhere-present Øystein K. Østerbø). And I think it was a good choice - during the Middle final itself, competitors would hardly be able to enjoy views like this. And the World Cup for the third time - I am also involved in maps for the third round in Kongsberg, Norway on June 6th to 9th 2014. We were mapping there during the last two summers. I will post here something about it later, meanwhile look at pics and also vids from the last year's mapping from my fellow Martin Poklop alias Víčko - who by the way is a member of Czech national team for the upcoming WC in Spain (he didn't map there). Let's keep fingers crossed for him! Another year is behind us. Last year I didn't make a lot of mapping work. My mapping was overtaken by the art history. All the energy I devoted to finishing studies and to the production of our project called Young lions in a cage, consisting of exhibition, book and conference dedicated to German-Czech speaking artists of the interwar Czechoslovakia. During spring I made at least one map in France. But Jan was busy. He was so busy he did not have time to write almost anything on the web, but the maps for the Junior World Championships, the upcoming World Cup in Turkey in 2014, in Norway, near Niagara Falls and many others do not require further explanation. Just to hang them here is missing. This year we will map again. As usual. Jan full-time, I sporadically. We wish everyone good health in the new year and let you enjoy a lot of fun not only with our maps. As a spectator, an amateur photographer and a half participant of JWOC Tour (3 stages in the category T3) I enjoyed it excellently. Later I will update samples of my parts of the maps and used basemaps. You can find all the maps with courses on the clearly arranged JWOC pages. Anyway a good map should be just a neutral tool for the best prepared athletes to achieve the top results, and to enjoy the race even for the others - and hopefully that succeeded once again. At least I didn't heard any heated discussions about the maps during the championships. To celebrate Czech medal successes of the last two days (Michal Hubáček's silver from the sprint race and both golden relay teams), rakija brought from the previous mapping in Serbia helped a little bit - and somewhat symbolically, as in 2014 the JWOC will be held in Bulgaria and the European Youth Orienteering Championships in Macedonia. Before today's departure to Norway for my already fourth mapping session near Kongsberg I've compiled the first package of photos, only from the Sprint race in the centre of Hradec Králové at the moment. More pics will follow later. The Junior World Orienteering Championships 2013 and the public 6-days competition JWOC Tour near Hradec Králové in the Czech Republic will start in less than two weeks! So it's high time for me to reveal my participation in the mapping. Besides me, the JWOC mapping team consists of Aleš Hejna, Petr Mareček and especially Zdeněk Sokolář, who besides plenty of his mapping had as a coordinator an unrevwarding job to force the rest of us to meet deadlines and mapping norms. And above that, under the watchful gaze of Jan Langr as a supervisor of the mapping project and also both national and senior advisors, course planners... As always, a desirable result of all these efforts should be that a competitor doesn't even realize he holds any map in his hands. Judge for yourselves later. The main part of the work - mapping for the JWOC races - took place last spring, while in recent months we have been thoroughly revised all the maps. I made the map for the Sprint race in the city centre of Hradec Králové and a minor part of the map for the Middle near Radvanice. And I revised all the map for the Long distance race near Odolov. Thermenland Open with WRE event for the first time in Croatia - already on 14-16 June! After the February in Turkey, Croatia was in the order in the March - again with an entirely different terrain, but also the weather. I and Milan Bílý came back to the scene near Novi Marof to enlarge our previous map Lužec-Čistinje by more than 1km² containing the other hundreds of depressions and pits. The long distance race included in the WRE calendar as a part of the multi-day event Thermenland Open 2013 (and as the Croatian long distance Campionships too) will be held there on 15th June. After spring temperatures in Antalya, we got a chance to "enjoy" a few more days of genuine winter with some 20cm of fresh snow. But, thanks to the terrain without rocks and stones and with clear vegetation, the snow didn't affect quality of the work but only the speed. I liked a lot the mapping there even for the second time and I can only recommend participation in the event once again! The winter break passed faster than I had hoped - I barely managed to draw very laborious maps for Cappadocia Cup before beginning of my 12th mapper's season on February 11th, and once again in Turkey. "Stone forests" of Cappadocia was replaced by Anatolian pines, pebble beaches and rock cliffs rising straight from the blue-green waters of the Mediterranean Sea, at times even 40m high. And also ruins of Phaselis, an ancient port city - in my part it was mainly remains of a necropolis. While the map was done just a year before the race, the dignified amphitheatre for the victory ceremony was build in advance of some 2100 years. The map will be used for the final race of Event 1 of World Cup 2014, which will be held on March 1st 2014. Milan Bílý, Jiří Daněk and our Bulgarian colleagues Georgi Hadzhimitev and Georgi Kartalov were other members of the team. The mapper's year was quite busy again, which in combination with a constant intellectual and creative laziness and vice versa an increased training caused the Holiday Mappers web has remained somewhat neglected. I'll try to catch it up during the winter break. Already for the third time in a row I've had an opportunity to enjoy the end of the season in attractive terrains of Turkish Cappadocia, where we are preparing maps for the 3rd 3-days Cappadocia Cup (22 to 24 March 2013). Aleš Hejna nor Jiří Daněk couldn't come this year but Zdeněk Sokolář and Milan Bílý replaced them capably. The weather is sometimes rainier this time and last week we even saw snow - for the first time here. In December, the altitude around 1100 m has an effect even here in the South. But the sun always wins sooner or later. We are expanding all of the three maps from the last year towards the north - surveying in Mustafapaşa and Göreme is already done, while Açik Saray map is close to completion. And after that I'll enjoy a short holiday in Istanbul, like last year. After two years we mapped on Pilat near St. Etienne again. It was traditionally in May, when the snow melted and everything started to bloom. Pleasant, although physically quite demanding mapping together with Radim Ondracek, Ludek Krticka and Zdenek Lenhart had all the attributes of the previous French sessions: intensive work, in vain attempts to draw at night, the daily supply of chips and local products. Typical was the long range of drawings that I dragged behind me through the evenings over six weeks. Less typical (instead of Norway, Czech Republic or Switzerland) was absence of laserscanning basemap, in France yet unavailable. Laborious positional and contour retro. The terrains on Pilat are interesting, there are small rocks and many vegetation details. Forest is mostly nice and diverse, so do not mind dense regular contour-to scramble up through the top rocks is a perfect feeling. In September you can come to Pélussin run it up. A middle distance race of Italian Cup (Coppa Italia) will be held on the map Bosco di Annibale (=Hannibal's Forest) near Rovegno in Val Trebbia (Trebbia Valley) in northern Italy on Sunday, April 22th. Most of the work was done by Rudi Ferrari and Martin Lejsek. I revised/remapped a piece of Italian Augusto Cavazzani's well-done part of the older o-map Rovegno - Cascina Morca (1991) in last September. Beside Cavazzani, six Czech mapmakers and also the legendary Finn Hannu Mähönen participated in making this large previous map (12km²). Follow the Rudi's blog (in Italian) to learn of an ancient as well as a newer orienteering history of Val Trebbia. Sunday's race is a part of Liguria 2012 - series of competitions and trainings in 5 days. For example, there will be a regional championship of Liguria on our last year's map Monte della Cavalla on Saturday. A 5-days competition in the summer 2013 will be the next major o-event in this area (in the period just before World Masters Games - including orienteering - in Torino, 200 km from there). A month ago, I together with Milan Bílý mapped another area just next to the Bosco di Annibale map near the Pietranera village for the fifth stage of the 5-days. The last remaining and, as Rudi said, the most interesting map should be done in the fall. Tábor (1:4 000) is an ISSOM map showing a labyrinth of narrow streets and a steep park in an old center of the South Bohemian historical town, which is one of the best o-terrains of its kind in my country. The map was used on 25th March for a traditional local sprint event (two rounds), this time with Czech national teams among participants. Hamrák (1:4 000) is another sprint map - this one displays not so old part of Prague - a settlement named Spořilov, where I had lived until I was 23 and where I went to school, too. Simply - my matter of the heart:) Used for a Prague regional event arranged by my club SK Praga on 31th March. Not only Tabor sprints (and the last stage of Cappad-O-cia Cup too), but also another Prague regional event organized by SK Praga was held on March 25th. The map used for the event, named Liščí bouda - východ (=east) and mapped in 2009-2010, displays an eastern part of the bigger area not used for the Relay and Club Championships two years ago. And the last one of the foursome is the map Doubravky, situated near Brno and used for Championship of Moravia and Silesia last weekend. Here you can see all the map for the individual race (long) with routechoices. 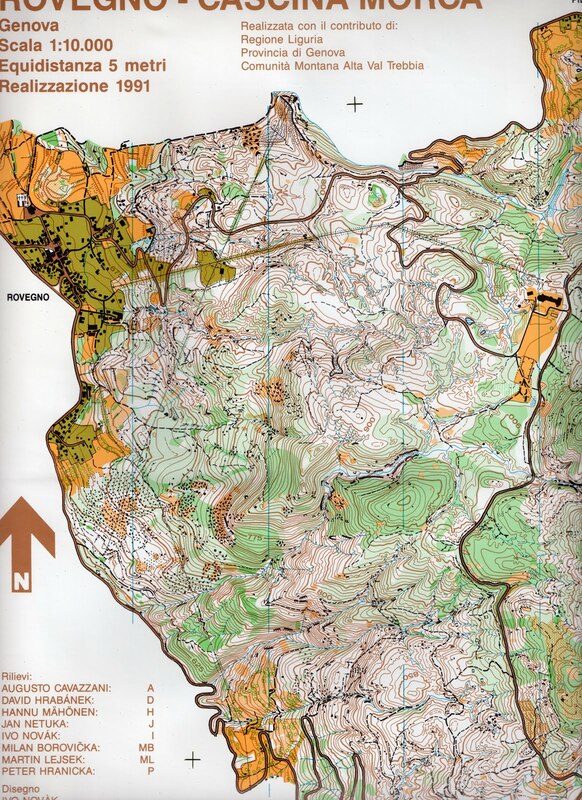 The map is an extended and revisited version of a northern part of our older map Zastávka, mapped for ARDF World Championship in 2004. HolidayMappers armed with accurate laserscanning basemaps heading to the region. After the successful mapping for World Cup 2011 coming another projects in attractive terrains near Liberec. At Saturday, April 14th regional race takes place in Ostašov on Karlinka map. This map from 2002, respectively 2010 went through a decent facelift by laserscan and a quick revision. For 2013 my O-club Slavia Liberec orienteering stands for organizing Czech national B event weekend in completely virgin area at the southern foot of Ještěd. This area called Druzcovský forest continues upwards to the rocks below Ještěd. Hopefully, the competition commission of Czech O-federation get us a chance to realize the race in this beautiful area. March is coming soon, so it's high time to wake up from a winter sleep, myself and also this website. I wasn't almost able to report on all of my current mapping projects in the last year. I will try to catch it up a bit this year, but we will see. For a start I could copy the suggestion from a one year old post: In March, go south! Even last year's destinations remain almost unchanged, only dates are reversed. As early as on March 3-4, the 24th Costa Calida will take place in the south of Spain, with the event center in Molina de Segura and on new maps close to the regional capital - Murcia. We mapped them in January together with Josef Marduk, Zdeněk Liščinský and Zdeněk Sokolář. This year's Beograd Open will start on March 31, so there is no more risk of the postponement due to snowfall like last year. Also there the competition area will be the same as last year, just expanded on plenty of depressions and contour curls in the new part we mapped in October. This time newly also with Zdeněk "Čenda" Sokolář. Each of these events includes one World ranking event (WRE) - it will be a long distance race in Spain and a middle in Turkey and in Serbia. The year 2011 is over. Again, I didn't realize a joint mapping project with Jan Drbal, but our virtual collaboration continues, which makes me happy. The year 2011 was for me in mapping clearly marked by the onset of high-quality basemaps from laserscanning, which are more accurate and in addition important feedback and encouragement to think about the way we work. But the essence remains the same-love for mapping, to stay in the wood, time spent with friends, striving for perfection and high expectations, if our way of interpreting the terrain runner fills. I just want to thank for this feedback, which pleases us and give us more energy. Let you enjoy our maps. We wish all the best for the new year. We have prepared a brief recapitulation of the genesis of the maps on the weekend World Cup in Liberec, with instructions how to use them. When you will hold the map at the start, we will be with you. We tried to perform our best for you to understand it. Good luck. During finishing the design of maps for World cup in Liberec was created new logo HolidayMappers, which will replace on maps existing dark square icon. The need for redesign our logo, we felt for a longer time, but because of continuous mapping somehow still was not sufficient time. The decisive impulse has become a breathtaking layout of World cup maps from the workshop of Ondrej Horacek, which we simply coudln't destroy with old shape of our original logo. We have therefore devised a new logo, more beautiful and perfect. I hope. At the same time as "Ivo's" World Cup in Liberec, Cup of Regions - Italian Champioship of regional teams - will take place in Liguria in Northern Italy. We mapped the map Cugno del Rizzo for relay already last year, while the map Monte della Cavalla for Sunday's individual long this year in April. We arrived with Čenda (Zdeněk) and Jiří Daněk and of course we were headed by Rudi. I really don't want to scare runners, but there is 285m of elevation at 800m of horizontal distance between the lowest and highest point of my small part of the map. Would you rather run it up or down? Together with Ludek Krticka and Zdenek Lenhart we map in Prémanon, near the border between France and Switzerland. Nice technical terrain 1100 m with karst features, a similar character like on World Cup map Le Grand Roc in Annecy. Thanks to Ludek working with perfectly prepared basemap (laserscan, shadow relief, vegetation). Mapping in 1:5000 scale, fine work. Compared to Annecy 2009 where we didn't have laserscan altimetry and had to make everything completely by eye with altimeter, we are now far more efficient and certainly more accurate. Basemap investment has paid off. Cascades of falling valleys create sink holes and interwoven strips of boulder fields platforms promise a real delicate orientation experience. In these days culminating more than a year-long preparation of maps for September World Cup in Liberec, which we have prepared together with Martin Lejsek and Mirek Horáček. The main part of the updates and mapping took place last autumn. Earlier this year released CUZK new elevation data from laserscan. We accepted this challenge and at that time already "finished" map, we underwent another wave of laborious corrections in the spring. Followed by track testing and further adjustments. The last form of the map presented in 2005 has undergone numerous changes. Refine the planimetry and altimetry, vegetation was changed. Single generalization approach significantly improved readability and got the map on the level of world o-scene. Now we complete the map on the model and we're going to the visit of IOF advisor, which will take place in early August. European Youth Orienteering Championships with its center in Jindřichův Hradec successfully took place last week. I mapped my small piece of the Sunday relay's map Hammer last October. The piece contained quite a lot of controlpoints during the race and also a granite rock wall Hradiště/Hamerský hill. I am not sure if competitors had time to notice it, but it is if fact a group of petrified giants, however it is nothing unusal in the landscape of Czech Canada. After Slovenia (2006) and Serbia (2009) it was my third participation in EYOC as a mapper. All the map with relay's routes is on the website of the event. June 23th-26th: European Youth Orienteering Championships (EYOC) will be held in Southern Bohemia. I made a minor part of the map for the relay competition, while Martin Kratochvíl made a major part. Czech national B-level races and public races will be held there too. July 2nd-6th: just a week later and a few kilometers NE, 5-days Czech Canada 2011 organized by my club SK Praga will be starting. Cestou k Senotínu, Kunějovské samoty, Pekelec, Graselova sluj and Zvůle are the maps made during the past 10 years (of course they will be updated). The second deadline for entries is June 16th! July 11th-17th: Kopaonik Open 2011 (5 stages + night-o) will be held in the mountain resort Kopaonik in southern Serbia. Our maps mapped in 2009 (updated in 2011) will be used. And we (with Zdeněk Sokolář and Daniel Lebar) are going to map some new area from the next week. July 22th-26th: finally, 5-days OOcup 2011 will be held in demanding karsty terrain in the west of Slovenia with the event centre in Lokve. The finish area of the first three stages will be near Mala Lazna cottage, same as 2 years ago. My parts of the map around Mala Lazna mapped piece by piece from 2007 to May 2011 will be used probably for stages 1st and 3rd. The other mapmakers: István Földi (ROM), Roman Horký (CZE), Viktor Kirianov (UKR), Daniel Lebar (SLO/CZE), Martin Lejsek (CZE), Ivan Nagy (SLO), Zdeněk Sokolář (CZE), Mile Stevanović (SRB). You can still enter with normal fee! Together with Radim Ondráček and Luděk Krtička we prepare the maps for Norwegian Championships 2012, which organize club Nydalens SK from Oslo. We are mapping for middle and relay, beautiful varied terrain north of the city, where alternates the slope with boulders, plain with swamps and typical technical passage with rocks in rugged terrain with changeable vegetation. Map for long in the neighboring forest prepare Dag Amundsen. Beograd Open 2011 postponed for two weeks due to snow! The 2-day Beograd Open 2011 event on our map Babe-jug has been postponed! Important news from Dejan Avramović, the chief of the event: "... unfortunately, we have to postponed the competition due to the fact there is a lot of snow on the terrain. Yesterday we visited the terrain and measured 10 cm snow at the finish area on open land and 15-18 cm in the forest. ... Because of this, officialy competition will be postponed for two weeks, 19-20.3.2011." More info on the event website. Surprising for me, as here in the south of Moravia we have almost forgot in the last months, what snow looks like. Finally, examples of the first maps in Turkish Cappadocia! We have added two new items into the Maps menu - of course Turkey, and also Coming soon... with the expected content. My first this year's mapping took place once again near Cehegín in Murcia region in the southeast of Spain in January. Ivo' unfortunately could not come this year, otherwise the team was the same - once again Josef Marduk has mapped the largest area, and Vlastislav and I weren't able to co-ordinate our schedule, so we didn't met there. Well, as the last year's off-road had broke down, it was replaced by a new car from a car rental. The weather was perfect so it was cold only at home in Casa de Europa in the evenings. In the southern Spain, they simply don't bother about a thermal insulation much. At the end of 2010 released CUZK new elevation data, digital elevation model CR 4th generation. On the domestic O-scene already informed about this Ludek Krticka in mapping kitchen and in January 2011 Jan Langr first time tested the product in terrain. This weekend I tried laserscan too - on a map prepared for the World Cup in Liberec. Data from laserscan are common for example in Switzerland or Norway. With the end of this year are becoming commonplace on selected areas in Czech Republic. New altimetry completely change the quality of maps and will also change the existing way of mapping work. While still mapmaker laboriously constructed the contours, now the mapmakers will decide which of the precise shapes put in the map and how "smoothing" laserscan data. In combination with the orthophoto and GPS, laserscan will significantly refine complicated measuring in long ridges or rocky terrain. As a result, it will lead to a substantial reduction of mapping time and therefore cheaper maps. Laserscan sets the current mapping work merciless mirror and clearly separates the wheat from the chaff. Good maps undergo small changes in elevation, and consequently by the positioning in difficult measurable locations, a bad maps suffering earthquake. Another factor that significantly affects the production of maps during year is massive onset of tablets. Also for conservative mapmaker like me it's clear, that the handdrawing on mapping desk are gone and acquisitions of UMPC machine is only a matter of time - offer and price. 2-day Beograd Open 2011 will be held already in 3 weeks on Babe-jug, rather a small map whose west part I was mapping in the autumn 2010. The main credit for the attractiveness of the terrain for orienteering belongs to the Romans, although it probably was not their goal. And the Roman procurator named Baebenius has responsibility for the name of the map, the hotel where the event centre will be, and nearby village - Babe (jug means south). There are tens of knolls and hundreds of depressions and pits of various sizes as remains of the ancient Roman mining activities (lead, silver?). In addition, a small number of paths, mostly well runable beech and oak forest and also some open areas in the eastern part, altitude 190-320m. O-delicasy! Examples of the maps, photos and further information will follow soon. Sending the latest mapping backlogs. This year once again brought a nice mapping, time spent with friends, alone in a quiet forest, and a new acquaintance. For me personally, it was the first year when I was mapping in gumboots. HolidayMappers perfomed again good maps for events of larger and smaller caliber. We have mapped in new destinations, but our style and way of working remains the same. I would like to thank everyone with whom we cooperated this year. I also think of our friends mapmakers, who this year got into serious living situations and believe that we can meet again on other projects. I wish everyone happiness and health in the new year. Let the maps speak to you understandable speech. "...to continue orienteering about a fast run, not about a walk with the map." Interview in Czech language with the Czech national team member Eva Juřeníková, who is living in Sweden, not only about one race, but also maps and mapping in the orienteering world scene, and how perceive these things top runners. In addition to all these foregoing events, I've mapped twice this year in Norway (3 revisions and one new mapping) and once in Slovenia (I've enlarged our map from 2008 for the next issue of OO.cup at Mala Lazna). I will add all the maps here later, perhaps during the winter holidays, now still imaginary. If everything goes well, until then I plan a mapping in Czech Canada and in Serbia in October, and for the first time in Turkey in November. It should be my 17th mapped country and the third mapping outside Europe. Anyway, since returning from Norway in late August, I keep just south of Brno for the rest of the year. It was Rudi de Ferrari who asked me to participate in a mapping of the map Cugno del Rizzo. The area is located in Liguria, a mountainous region in norhern Italy (more accurately in Natural Park of Antol, 40 km NE of Genoa). First I met Rudi in March 2008 in Puglia, during somewhat bizzare blitz mapping of Castel de Monte. This time almost 11 months left until the race so we worked without stress. As a very amateur photographer I found that this landscape, including its inhabitants and the weather, is photogenic enough for a separate gallery (I will update a link later). I hope I have managed to put something from reality to the photos. A pessimistic mapmaker would say the landscape was quite steep in some places, sometimes the weather was too wet and some of the inhabitants bothered him at work a bit. But I liked all aspects. Czech Relay and Club Championships was held on this weekend on the map named Liščí bouda 2 (liščí bouda means 'a fox shed') newly mapped by me and Zdeněk Sokolář. The Champs were arranged by my club SK Praga, and our club teams achieved a victory both in H21 in the relays on Saturday and in DH21 in the team competition on Sunday. Great!!! Our map is already the third o-map of this area. The oldest one in the scale 1:20 000 (by Pavel Junek) was issued in 1974. Notice the (over)thoughtful map legend. I have still remembered the newer one from 1984 (by Petr Uher, in the scale 1:15 000) from my competitions in H14 up to now. It was wery well drawn and printed, at that time. And as regards to our fresh 1:10 000 map, I can say responsibly that this is the most beautiful area I have ever mapped in the (former) district of Příbram. Why we still do the maps in France? The answer is simple. The French are the real masters of the mapping gastronomy. They can only compete with the Spaniards. In these countries has consumerism a good tradition and clubs are able to provide excellent catering, unlike of cool Germans, Austrians or Swiss. Due this perfect service it is possible fully concentrate to the mapping and the efficiency is significantly increased. The mapmakers powered by meat, wine and chips working like a agog. Together with Radims we finished Cret de Peillouté from spring-a hill situated in The Natural Park Pilat in 1200m with beautiful old beech forest with a lot of stones, on the top and down in the valley also with undergrowth rumpus and wires. Méďa and Krtek made the map Pont Sauvignet near Le Bessat. 1st stage of popular 5-day event OrienteeringOnline cup was held on the new map Podvin on Saturday. I have mapped a part of the map with Zdeněk Sokolář for several days in April, and Daniel Lebar has completed it later. It was nice spring mapping for us, and relatively fast and certainly nice middle distance race for OO.cup participants (RouteGadget here). Last 3 stages of the demanding 5-day event is going just in these days on Velika Planina. Together with Ludek Krticka we start second week of mapping in Oslo. Huge forest behind the town by Songsvann lake is probably the most frequently used orienteering map in Norway. We make an update. It means better positioning, more exactly drawing of contours, which seems to be mostly only redraw from photogrammetry until this time, better readability and also generalization. I measure still in old school style, by step and with empathy, but I started parallely use a GPS logger. For open areas it is OK, otherwise for nothing. Beautiful terrain! We loose the concentration only through beautiful Norway girls who run around the lakes and through mosquitos, which are keeping us still in moving. There is a light till midnight-I feel free but totaly tired. 2-days Bob Rock Cup was held on this weekend on the new map Hrastovec in the northeast of Slovenia. I have mapped it together with Zdeněk Sokolář and Osvald Kozák in winter 2008/9. An update (and a coursesetting) was done by Daniel Lebar. There is like a fairy tale castle named Hrastovec on the edge of the map. Currently there is a psychiatric hospital. Also the forrest itself is like from a fairy tale - as D.L. said: "On Hrastovec I sometimes felt like Alice in Wonderland." Slovenian Long and Relay Championship was held on this weekend in a carst and hilly terrain 10 km north of Lubljana. We (Zdeněk Sokolář and me) have revised the previous (quite a good quality) map Debeli Vrh (2005) in April. Z.S. alias Čenda also have been the course planner. As you can see in results of Long, Andraž Hribar in M21E (10,2km, climb. 550m, 25 c.) achieved the best performance of all runners as usually. His time 73:14 surprised even the experienced course planner. It was only the second man in the rank, who fulfilled supposed time 85 minutes. We are curious whether Andraž will challenge European top runners at EOC in Bulgaria. Thanks to the unexpected departure from mapping in France, I managed to join the meeting Organization Committee of World Cup in Liberec with IOF advisor Kjell Blomseth from Norway. By tea at the pub and during next day in the forest we discussed everything. The negotiations were marked by a positive spirit. I was surprised by the openness of Norwegian delegate access to the application of map key, particularly in the questions of vegetation. The current form of map from 2005 need the generalization and modification of present Czech view to reflect more the requirements of IOF. After somewhat relaxed winter, the spring mapping season has run at full blast, so my updates of this web have had to wait. One of the earliest race weekends in Sør-Trøndelag region (NOR) was held on 24 and 25 April in Bjugn, traditionally on our maps. This time it was even 3 races over the weekend - first it was Sprint on my map Botngård, followed by Middle with chasing start on the map Blankheia (mapped mostly by Petr Matula and Tom Novák, I have made only a smaller part) on Saturday, and Long at the same place on Sunday. Øystein Kvaal Østerbø, the winner of the Sprint in H21, writes about the Saturday's races. Organisers of the forthcoming WOC 2010 in Trondheim were using the competition to test GPS tracking - in D21 during the sprint race and in H21 during the long distance race.